This month's Sparkles Christmas Challenge is "Must Have More Than One Fold". Thank you Jane for this fun challenge. Mine has 3 folds and this challenge was a perfect time to use my new StampinUp - Hearts Come Home bundle. Lots of sparkle on this card, and by the time I finished....lots of sparkle on me, on my dog, and even on my hubby! I like it! This post is probably my shortest.....When it goes live I will be spending time with my BFF, since pre-school, Dee Dee. She's recovering from hip surgery, and I'm nursing a nasty knee. We will be in San Francisco letting my son drive two Miss Daisies around town. Lucky him! So I'm off to get ready for Dee Dee to arrive. Until next time....Happy Crafting....not wanting to strike fear into the hearts of crafters, but the holidays are right around the corner....so get those cards made! 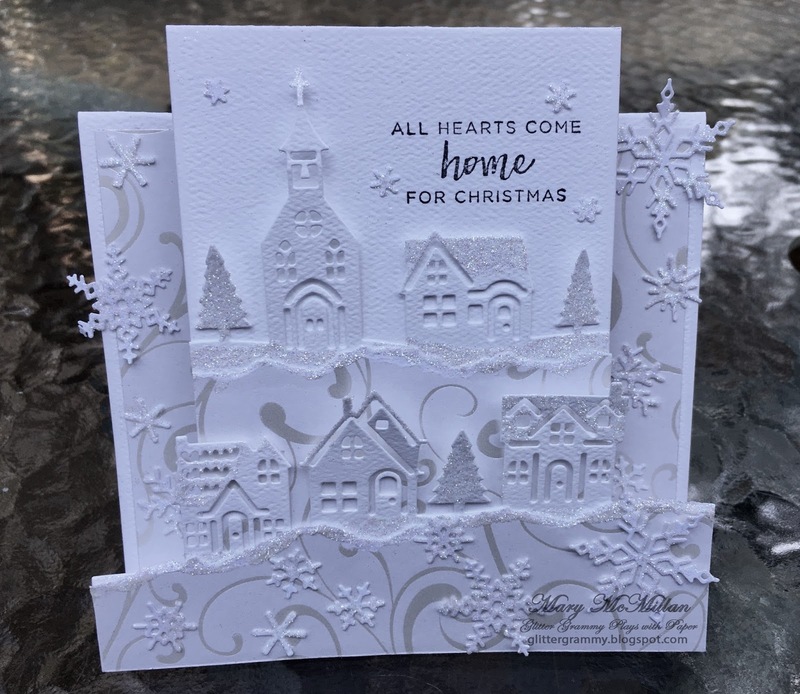 Absolutely gorgeous, love your wintery card Mary, those houses are adorable. Stunning WOW creation here Mary! love stepper cards and what a fabulous scene you had created..hope your sight seeing went to plan and you had a wonderful time.. sorry you have a bad knee..
Mary, What a beautiful card! Love that striking white on white effect. Hi Mary, your card is exceptional. So eye-catching and simply stunning. I love it. Hope youre both on the mend and that your bad knee improves soon. Take lots of care.